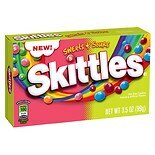 Shop Skittles Candy Theater Box Sweet & Sour, Sweets + Sours (3.5 oz. )3.5 oz. 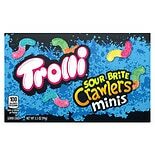 Shop Trolli Sour Brite Crawlers Minis Theater Box (3.5 oz. )3.5 oz. 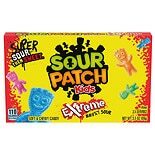 Shop Sour Patch Kids Extreme Candy Sour (3.5 oz. )3.5 oz. 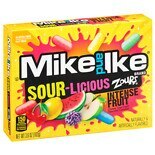 Shop Mike and Ike Zours Chewy Sour Candies Intense Fruit (3.6 oz. )3.6 oz. 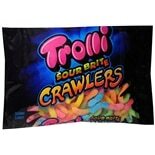 Shop Trolli Sour Brite Crawlers Bag Assorted (14 oz. )14 oz. 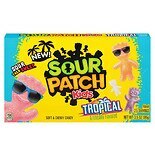 Shop Sour Patch Kids Candy Tropical (3.5 oz. )3.5 oz. 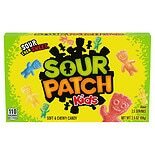 Shop Sour Patch Kids Soft & Chewy Candy (3.5 oz. )3.5 oz. 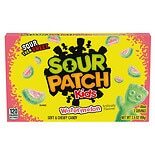 Shop Sour Patch Kids Watermelon Soft & Chewy Candy (3.5 oz. )3.5 oz. 4 for 4 dollars and 00 cents or 1 for 1 dollars and 69 cents 4/$4.00 or 1/$1.69$0.48 / oz.